Canon UK were kind enough to send us a sample Speedlite 600EX to review. This particular model does not feature a built-in radio transceiver, making it distinct from the otherwise identical Speedlite 600EX-RT and incompatible with the new Speedlite Transmitter ST-E3-RT. Perhaps the most apt description for this flashgun would be the direct replacement to the (now discontinued) flagship 580EX II. Used as an infrared master on your camera, the Canon 600EX can control remote speedlights such as the 580EX II and 430EX II. It will also act as slave to the 580EX II, ST-E2, 600EX-RT, another 600EX or the 7D and 60D’s pop-up flash. There are third-party masters and slaves from Nissin, Metz, Yongnuo et al. The 600EX has been overshadowed by the 600EX-RT, barely getting a mention on many popular photography news portals. Some online shops stock the more expensive RT model but not the non-radio 600EX. Canon USA’s own product catalogue does not mention the 600EX, as if this model doesn’t even exist. Why? We don’t know. For technical information in English you can refer to the 600EX product page on Canon UK’s web site. Radio triggering allows a photographer to position their off-camera speedlights further away while maintaining a reliable connection. There is no long TTL cord to trip over and unlike standard infrared-triggered E-TTL, the system will work outdoors in bright sunlight without the need for direct line-of-sight. But the 600EX we have here does not feature radio. If you own one and want wireless TTL, you must face the limitations of infrared or splash out on some third-party TTL triggers. In the marketplace at the moment, you have the choice of the PocketWizard FlexTT5, RadioPopper PX, Phottix Odin, Hähnel Tuff TTL or Pixel King. We’ve been trying out the latter to test its compatibility with the 600EX. 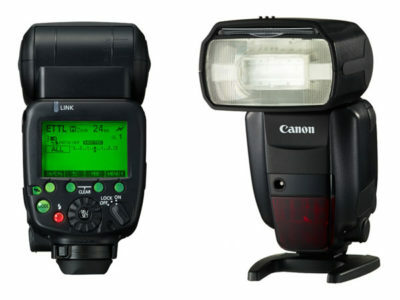 As a first-time buyer it might seem counter-intuitive to invest in a set of these TTL triggers, which can be pricey, when for only £40 more than the 600EX you can get the 600EX-RT and use Canon’s own radio solution. On the other hand, if you are an existing Canon customer, you might already own a 580EX II or 430EX II. In this case, the third-party triggers are advantageous as they allow you to control all your speedlights by radio. Canon haven’t made any kind of gadget to allow their older speedlights to work with the RT wireless frequencies (yet). The RT system is not compatible with the frequencies of third-party triggers. When we mount the Speedlite on to a King receiver, the 600EX behaves almost exactly the same as if it were on camera. TTL mode works seamlessly (within the limitations of TTL metering) including exposure compensation and autozoom. You can also switch the flash into Manual mode and it will still fire, but there seems little point in doing this, unless you are controlling the power level through your EOS DSLR’s in-camera flash menu. The 600EX synchronises all the way up to 1/8000 second shutter speed without incident, utilising High Speed Sync (HSS) through the Kings. There is no banding. Switching between very high and very low shutter speeds either side of X-Sync is as simple as turning the control dial – no extra steps required. We haven’t missed a shot so far. Any dark frames are attributable to silly things like forgetting to switch the flash on, pointing it the wrong way or picking exposure settings that are too low for the environment. When the Kings are communicating with each other their LED indicators glow blue. If this isn’t happening, check your channels or groups or change the batteries. When the shutter button on your camera is pressed halfway, the AF-assist lamp on the 600EX will light up, even when mounted on a King receiver off-camera. This can be useful for focussing in low light so long as there are no umbrellas, softboxes etc. between your Speedlite and your subject. For Pixel King technical specifications, see the manufacturer’s product page. More test results and some sample photos will be added to this article later. Watch this space. A review of the 600EX itself will be published separately. The recommended retail price of the 600EX flashgun is £639.99, with the radio-enabled 600EX-RT set at £679. At the time of writing, British shops haven’t budged from the original RRP. For your nearest Canon stockist, check here. In the USA, the Speedlite 600EX-RT is priced at $629.99 RRP, minus a $30 instant rebate. Neither B&H Photo nor Adorama – the two major stores in New York – list the Canon 600EX yet. If you spot it on sale somewhere, share the link with us in the comments below. 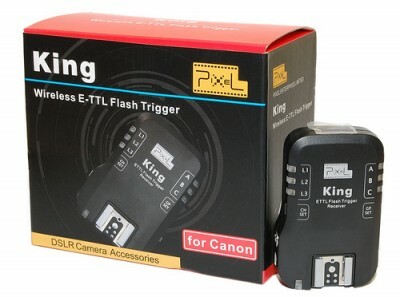 The Pixel King for Canon costs under US$140 online for a single transmitter-receiver kit. UK stockists sell kits for around £100.